What is the Food Safety Modernization Act (also known as FSMA) and does it apply to me? If you operate a farm business that grows and sells fresh produce—and/or processes, packs, manufactures, or holds food, your business may be affected by FSMA. Some businesses may not be affected at all, some may be affected by one rule, and some may be affected by both rules. See the National Sustainable Agriculture Coalition website for an overview of FSMA and how it applies to small and medium-sized farms, as well as up-to-date information on FSMA. Below is information to help you understand food safety on your farm and to see how your farm might be affected. There are also templates for developing a food-safety plan. For more information on compliance for producers and producer FSMA training see the Produce Safety Alliance web site. What Does FSMA Mean for Farmers? More information and a full flowchart can be downloaded via this link. 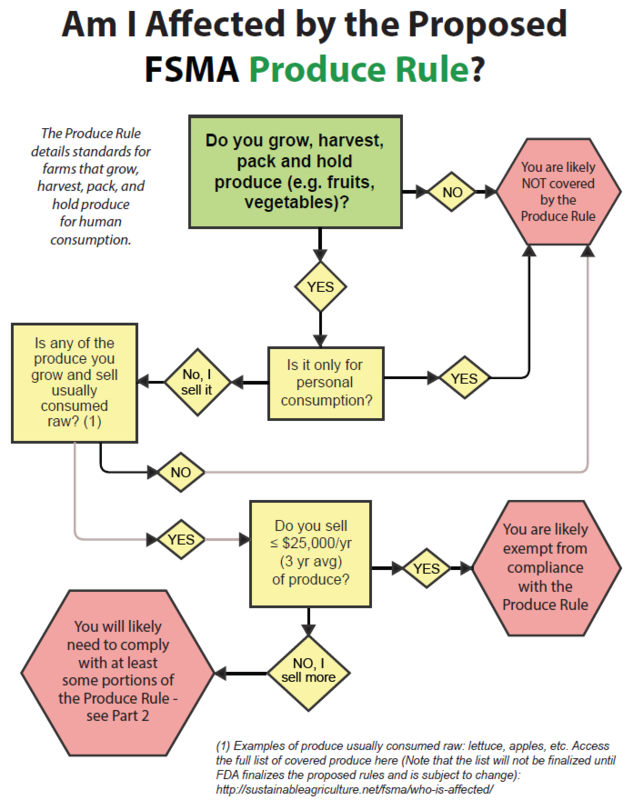 The Food and Drug Administration has developed a flow chart to help producers determine if they are exempt or have some qualified exemptions. Use the GAPS audit checklist for conducting an internal audit. Go over the GAPS audit checklist before your audit is scheduled. The USDA GroupGAP is a farm food-safety audit program that allows producers to attain GAP certification as a group. See the National Good Food Network fact sheet on this topic.